This season brings back a lot of good memories from my childhood. During the fall, we spent a lot of time at the wineries, attending jazz concerts, antique shopping, and going to tea houses. I remember dressing up in my prettiest dresses, hats, matching shoes, and purse -- feeling like a little princess ready for the ball. I know it sounds a bit odd, but I always wanted to go everywhere with my parents, and it was enjoyable to be around them and their friends, and being that I was the only kid, I was showered with so much attention. Don't get me wrong, I love my brother dearly, but I'm so glad that I got eleven years of love and attention from my parents all to myself. I will always hold those memories close to my heart. 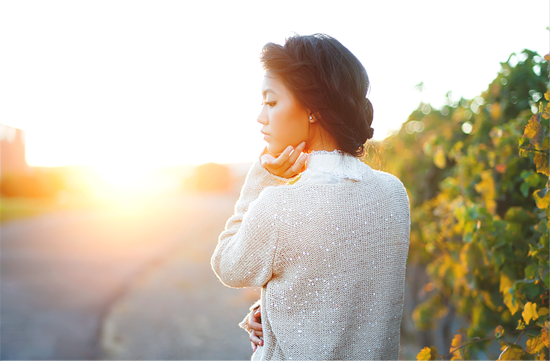 To celebrate Autumn and the nostalgic feelings that I get during this season, I wanted this outfit to be taken at the winery during sunset -- drenched in sun, and rich in golden amber hues. 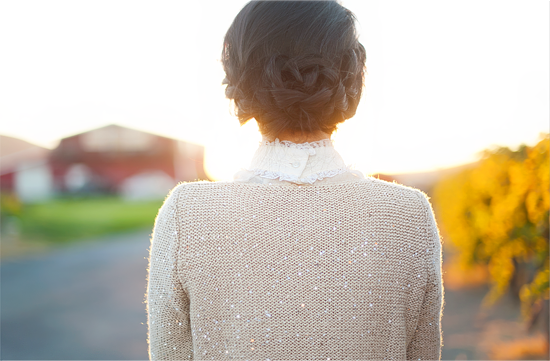 Lucky for us, we were graced with the most beautiful sunset during our shoot. 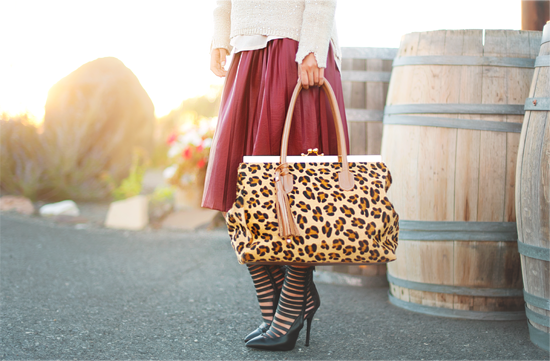 The knitted, sequined, chiffon layered sweater, and victorian lace top was the perfect juxtaposition for the faux burgundy leather pleated skirt, caged ankle boots, and leopard pony-hair purse. A fall outfit that I consider to be classy, feminine, and mildly bold. I call this one, Merlot. Enjoy! Gorgeous! You look like a doll! Having your parents full attention in those years create so many memories.